Please e-mail or call me at 902 543-2909 regarding your credit card info along with your order, name and address. 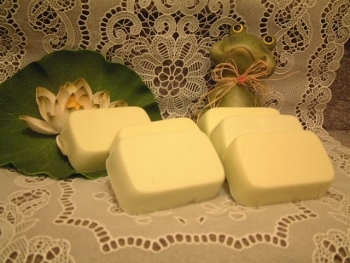 Made with a Goat's Milk Base, Oatmeal, Vitamin E, Herbal Shampoo, Tea Tree and Peppermint essential oils. Properties: Since this oil is an anti-inflammatory, antiseptic and astringent, it helps relieve pets of their most common topical skin problems, while it acts to cool and relieve irritated skin associated with flea bites and other minor skin irritations. Also a great bug repellent. Great for everyday use. Tea Tree: Medicinal, fresh, woody, earthy, herbaceous. 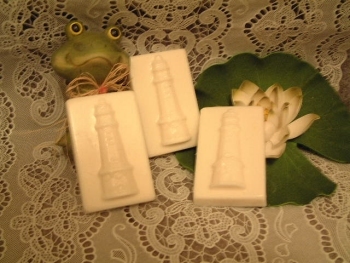 Properties: A well known antiseptic and insect repellent, that is good for several skin conditions since it is anti-fungal. This natural anti-inflammatory oil helps speed up the healing process of itchy, chafed skin and hot spots caused by flea bites, itching, dandruff, or other dermatitis. 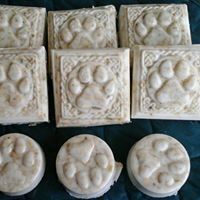 Helps to heal bites, oily skin, ringworm, sores, cuts and abrasions. Your pet will be healthier and happier after just one use. 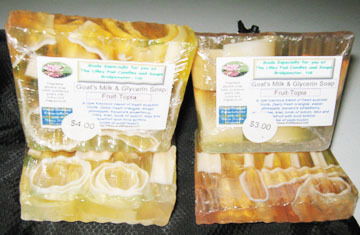 Goat's Milk Soaps with Cocoa, Shea and Mango Butters with extra honey unless otherwise specified. 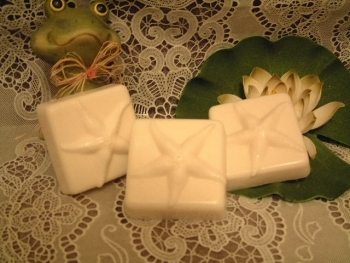 Loaf Chunk Soaps in sizes of 3 to 4 oz each. The loaf is approximately 30-40 ozs. A minimum order of 30 oz. is required of the same scent and colour. 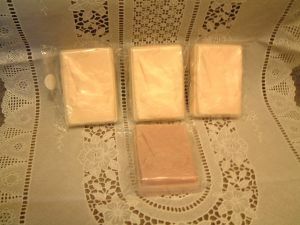 The soaps are packaged in clear cello with ribbon (your choice) and cost $1.00 per ounce. 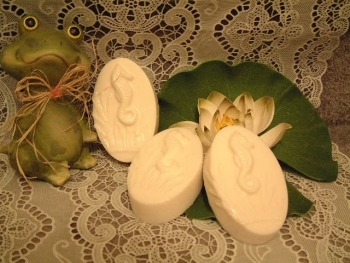 Coming up with new ideas and recipes is part of the fun in making soaps. 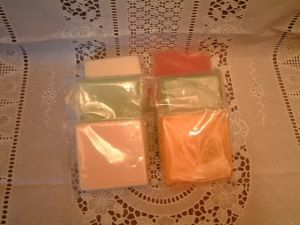 One very popular style is the chunk soap and these can be made in a variety of colour, fragrances and sizes. Or please e-mail me for more info on wholesale or discount prices.